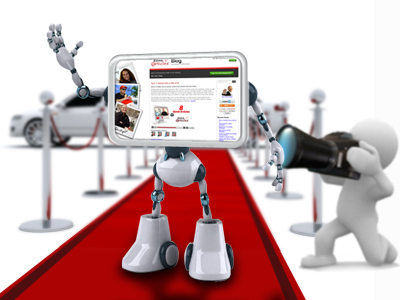 Our new Blog theme made its “red carpet” debut last Thursday! The updated theme has a new appearance and new navigation features that’ll make it easy for you to find what you’re looking for. Don’t worry, our older posts aren’t going anywhere. They’ll still be accessible through the Archive. Plus, we’ll continue to use the Blog to share article writing and marketing tips, strategies and insights. So, what do you think of the new look? We hope the upgrades will make your visits to our Blog more enjoyable and engaging. Now we need your input. How do you like the changes? Is there anything about the new theme that you really like/don’t like? Any ideas for the future? Leave a comment to let us know what you think. Looking good! It’s a crisp, clean presentation. I like it. changes are always must for progress. wish all success to new look. I think it looks awesome. Goes with the overall look of EzineArticles much better. Good job you provided a summary, otherwise some of us wouldn’t have picked up the details. As sites are our buildings on the online world, a makeover every so often is not a bad idea. Great design – clear, simple, easy to read, easy to use. Thank you…! Look great… Good Job done! Awesome Job! Just like the rest of the EzineArticles organization. The only thing is that confuses me is why there is no direct link to the main EzineArticles homepage or the members area… would be nice. Hi, as a web designer this can happen as their are so many things to take into account, I think you’ve done a fantastic job and its all very much appreciated, thanks to you all and good luck !! It is looking good. Simplistic, user friendly and the design is cohesive with the rest of EzineArticles. Yes yes, looking fab, well done guys !! Great designs !! I like it has style. I love the new, innovative look–so dramatic, yet so cool! changes are always for the best. Well done EzineArticles. com! Cheers! I like the style and design. Great to see someone being innovative.